This study documents that earnings announcements serve as a reality check on short-term, fear and greed driven price development: stocks with extreme abnormal returns in the week before an earnings announcement experience strong price reversal around the announcement. A trading strategy that exploits this reversal is profitable in 40 of the last 42 years and earns abnormal returns in excess of 1.3% over a two day-window. "In this study, we develop a trading strategy around earnings announcements that seeks to profit from predictable reversals of fear and greed driven price development in individual stocks. We argue that earnings announcements are logical events around which to center such a trading strategy, because they convey fundamental information about asset prices and thus have the potential to “break” irrational price development. Moreover, because of heightened information asymmetry in the period just before an earnings announcement, price development is probably particularly susceptible to excessive fear or greed. That is, if uninformed investors observe sharp price changes just before an earnings announcement, they may attribute these to the informed trading of insiders; start to excessively trade in the same direction themselves; and thus cause an overreaction. We therefore predict—in the spirit of Warren Buffett’s advice—that stocks that experience sharp price changes just before an earnings announcement will experience price reversal at the time of the announcement itself. We test this prediction with a trading strategy that on the earnings announcement date takes (1) a long position in stocks that experienced extreme negative abnormal returns in the week prior, and (2) a short position in stocks that experienced extreme positive abnormal returns in the week prior. We find that, over the two day window of the earnings announcement date and the day following, both positions are highly profitable. On average, the long position earns abnormal returns of 1.49%, and the short position earns 1.20%. We furthermore show that these return reversals are about 60% larger than around non-earnings announcement dates, and thus are significantly more pronounced than short-term return reversals documented in the prior literature. We also show that our strategy (1) is profitable in 40 of the 42 years in our sample; (2) is similarly profitable in “bear” and “bull” markets; (3) and is significantly profitable for both large firms and high volume stocks. Since the year 2000—using a conservative transactions costs estimate of 70 basis points for a round trip trade—we find that our strategy generates abnormal returns of 0.76% after transaction costs, or 95% on an annualized basis. We conclude, therefore, that prices are subject to sentiment-driven price development in the period of elevated information asymmetry just before earnings announcements, and that the announcements themselves serve as a reality check on that price development." What is the logic behind this strategy? Jonathan A. Milian in his paper "Overreacting to a History of Underreaction" explores the possibility that well known cross sectional anomalies can reverse over time. And he picks the premier anomaly - Post Earnings Announcement Drift. He finds that stocks with the most negative previous earnings surprise actually exhibit the most positive returns very shortly after the subsequent earnings announcement. The academic paper speculates that it seems that due to well-documented history of investors underreacting to earnings news, investors are now overreacting to earnings announcement news. Investors position themselves in alignment with the expectation of the PEAD effect so when the next earnings announcement comes, the overcrowding of investors pushes the market beyond efficient, resulting in the correction of investor sentiment and a negative correlation for firm's earnings news in the following days. However classical PEAD (post-earnings announcement drift) literature examines mainly quarterly portfolio returns while this academic paper focuses on 2-days retun therefore it is probable that PEAD still holds and both anomalies exists concurrently. Matthew Lee from Quantopian performed an independed analysis of initial findings of Jonathan A. Milian's original academic paper (over a sample period from 2011 - 2016 compared to the Milian's 2003 - 2010). What Matthew found? Overall, he found his results to be consistent with Milian's results for all strategy's holding periods from 2-10 days. The best result was a hold period of 9 or 10 days following the Earnings Announcement, rather than 2 days. Firms in the highest decile of past earnings surprise underperform stocks in the lowest decile by -1.78% over a hold period of 10 days (compared to -1.59% over a hold period of 3 days found in the paper). So, what is the trading algorithm? The performance of trend following strategies can be ascribed to the difference between long-term and short-term realized variance. We revisit this general result and show that it holds for various definitions of trend strategies. This explains the positive convexity of the aggregate performance of Commodity Trading Advisors (CTAs) which -- when adequately measured -- turns out to be much stronger than anticipated. We also highlight interesting connections with so-called Risk Parity portfolios. Finally, we propose a new portfolio of strangle options that provides a pure exposure to the long-term variance of the underlying, offering yet another viewpoint on the link between trend and volatility. "In this paper we have shown that single-asset trend strategies have built-in convexity provided its returns are aggregated over the right time-scale, i.e., that of the trend filter. In fact, the performance of trend-following can be viewed as swap between long-term realized variance (typicaly the timescale of the trending filter) and a short-term realized variance (the rebalancing of our portfolio). This feature is a generic property and holds for various filters and saturation levels. While trendfollowing strategies provide hedge against large moves unfolding over the long time scale, it is wrong to expect a 6 to 9 months trending system rebalanced every week to hedge against a market crash that lasts a few days. We dissected the performance of the SG CTA Index in terms of a simple replication index, using and un-saturated trend on equi-weighted pool of liquid assets. Assuming realistic fees, and fitting only the time-scale of the filter (found to be of the order of 6 months) we reached a very strong correlation (above 80%) with the SG Index, and furthermore fully captured the average drift (i.e. our replication has the same Sharpe ratio as the whole of the CTA industry). However, our analysis makes clear that CTAs do not provide the same hedge single-asset trends provide: some of the convexity is lost because of diversification. We however have found that CTAs do offer an interesting hedge to Risk-Parity portfolios. This property is quite interesting, and we feel it makes the trend a valid addition in the book of any manager holding Risk Parity products (or simply a diversified long position in both equities and bonds). Finally, we turned our attention to the much discussed link between trend-following and long-volatility strategies. We found that a simple trend model has exactly the same exposure to the long-term variance as a portfolio of naked strangles. The difference is the fact that the entry price of the latter is fixed by the implied volatility, while the cost of trend is the realized short-term variance. The pay-off of our strangle portfolio is model-independent and coincides with that of a traditional variance swap - except that the latter requires Back-Scholes assumptions. In other words, the option strategy is a better hedge and therefore its price should be higher than realized volatility. The premium paid on option markets is however oo high in the sense that long-vol portfolios have consistently lost money over the past 2 decades, while trend following strategies have actually posted positive performance. So, even if options provide a better hedge, trend following is a much cheaper way to hedge long-only exposure. All-in-all, our results prove that trending systems offer cheap protection to long-term large moves of the market. This coupled with the high statistical significance of this market anomaly, really sets trend-following apart in the world of investments strategies. A potential issue might be the global capacity of this strategy, but recent performance seems to be quite in line with long-term returns, so there is at presence little evidence of over-crowding." Title: Is Daily Pairs Trading of ETF-Stocks Profitable? Pairs trading is a venerable trading strategy. There is agreement that it worked fine in the far past. But it is less clear if it still profitable today. In this working paper the universe of eligible pairs is defined by the holdings of a given ETF. It is shown that the stocks must be from ETFs which select high-quality, low-volatility stocks. The usual closeness measure presented in the literature performs poor. The paper presents a simple and clearly superior alternative based on zero-crossings. The strategy performs with the correct universe and the improved pairs selection rule before trading costs quite fine. It depends on the assumed trading costs if this is also in real-trading life the case. "The seminal paper on pairs trading is Gatev et. al. . They authors did not invent the strategy. It was in common use since the 1980s. The pairs are formed from a universe of stocks. There is a one year formation period. Each stock is normalized to 1 at the beginning of this period. One selects for each stock the closest neighbor. The distance measure is the summed up squared daily difference of the normalized prices. The initial results with the distance method were rather disappointing. Pairs trading is based on mean-reversion. The distance measures if the stocks stick together. But sticking together and mean-reversion are two different concepts. Vidyamurthy proposes zero-crossings as an alternative. One counts the number of times the spread moved above or below the mean-spread. But this measure is also not satisfactory. It is known from the theory of Brownian-motions that zero-crossings are much more likely in the first few steps of the motion. If one starts at zero a small up- followed by a larger down-move is a zero crossing. The path moves in the following away from zero and a crossing gets very unlikely. The situation is somewhat different for a mean-reverting process but the general behavior is still the same. A zero (or mean) crossing does also not create a profit. The interesting case is a crossing which started initially outside the two-sigma band. This is the main distance function. A larger number of crossings is of course better than a lower one. For two pairs with the same number of crossing the distance is used as a secondary measure. But a pair with 5 crossings is always closer than a pair with only 4. The strategy defines also a minimum number of crossings (usually 4). A pair with less crossings is never traded. As already noted simulated trading is done from 2011-01-01 till 2016-07-26. 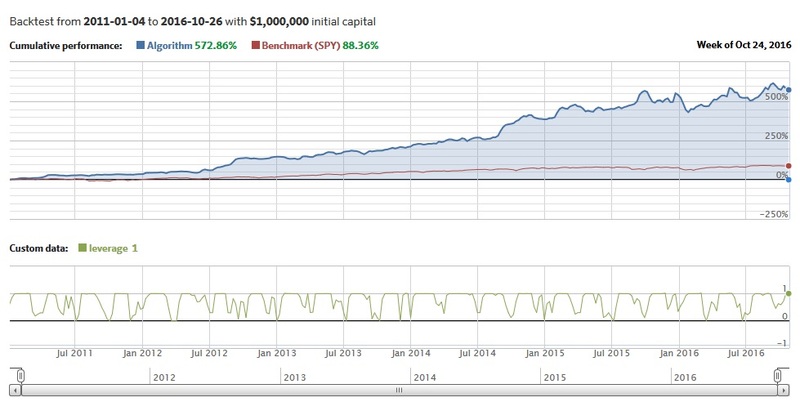 The strategy has an overall profit of 144.4%, a monthly Sharpe ratio of 1.16 and a max. relative drawdown of 8.2%." We examine a new method for identifying close economic substitutes in the context of relative value arbitrage. We show that close economic substitutes correspond to a special case of cointegration whereby individual prices have approximately the same exposure to a common nonstationary factor. A metric of closeness constructed from the cointegrating relation strongly predicts both convergence probability and profitability in cointegration-based pairs trading. From 1962 to 2013, a strategy of trading cointegrated pairs of near-parity generates 58 bps per month after trading costs, experiences a 71% convergence probability and outperforms a strategy of pairs selected by minimized price distances. "In the pairs trading literature, the most common type of relative value arbitrage, substitutes for individual stocks are identified by minimizing the Euclidean distance in the daily price space over a historical period.5 Matching stocks over the price space instead of the return space is consistent with short-term relative value trading strategies, while removing the need to specify factors. Although the matching method is simple to perform, by design, it guarantees the existence of a counterpart for every stock, which is counterintuitive. More importantly, stocks that exhibit little variation in the price pattern over the formation period (possibly due to lack of news flow) would end up being labelled close substitutes, although they are not fundamentally related. In this paper, we propose a simple method of identifying close economic substitutes using cointegration. When a pair of stock prices is cointegrated, one series co-moves with a scaled version of the other. We show that close economic substitutes can be represented by a system of cointegrated prices where the scaling factor, or the cointegration coefficient, is close to one. We find that from 1962 to 2013, NonParity, a positive-valued metric of closeness that measures the distance of the cointegration coefficient from unity, strongly predicts both the probability that relative mispricing will subsequently be corrected as well as the profitability of the arbitrage trade. A one standard deviation increase in the variable reduces the convergence probability by seven percentage points and pairs trade payoffs by 2.78 percentage points. Further, predictability through NonParity also presents profitable trading opportunities. At the portfolio level, the pairs trading of cointegrated stocks is generally unprofitable. However, when trading is confined to pairs of stocks with NonParity close to zero, the strategy is profitable after reasonable estimates of brokerage, slippage, and short selling costs. Specifically, over the sample period, the average after-cost risk-adjusted return to trading a portfolio of cointegrated pairs with NonParity less than 0.5 (0.2) is 0.43% per month, with a t-statistic of 5.29 (0.58% per month, with a t-statistic of 4.77)."